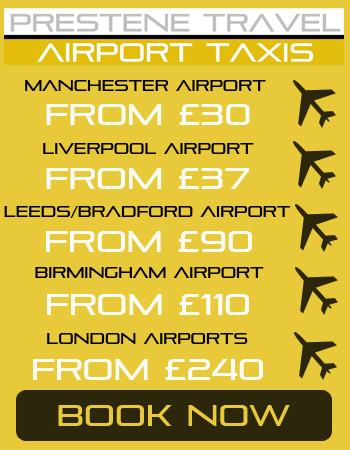 Covering Northwich, Cheshire, surrounding areas and the regional airports. View our service area for a complete list of destinations. Prestene Travel Ltd is the taxi company of choice for local people and tourists alike in the Northwich and surrounding areas! We operate a daily service from Cheshire and the surrounding areas to regional airports. To avoid unnecessary delays! Prestene Travel Ltd offers an all-inclusive corporate account tailored to your individual needs all designed to make your company and life easier! Looking for a taxi or minibus in Northwich, Manchester or Cheshire give Prestene Travel a call. Prestene Travel has a modern fleet with minibuses and executive vehicles for all our clients needs. We have a modern approach to the transportation of clients yet still we believe the customers needs are first and foremost. All vehicles are clean, modern and fitted with satellite navigation systems, our drivers are smart, honest, reliable and punctual. Customer service is our watch word if you need a taxi right away, call us on 01606 45909 now, we’re at your service 24 hours a day, seven days a week. For more information on our range of transport services, have a look at our website. Contact us for mini cabs and minibus hire across Manchester, Cheshire and Northwich. You can rely on us at Prestene travel for reliable and affordable transport,in the Northwich and surrounding areas whether it’s for that special occasion, or for the relaxing airport trip or just traveling to town. Let us at Prestene travel help we’re only a phone call away. Prestene travels fleet consists of modern luxury minibuses,executive vehicles, we also have access to luxury limousines ,also coaches upto 74 seaters through our partner companies. All our vehicles are equipped with satellite navigation systems to ensure unfailing accuracy and a prompt response. Sit back and enjoy the ride, because peace of mind is part of the deal! Prestene Travel Ltd ensures that every one of our clients gets the VIP treatment. It doesn’t matter if you’re a one-time traveller or a corporate client. Contact us today to make special arrangements for events such as weddings, airport, race days, concerts, football matches, meetings, and much more we can meet your needs. To make special arrangements for destinations not listed here, please call our office on 01606 45909 or 07759281467 or use our online booking form . Our affiliated fleet comprises modern saloon cars, luxury limousines, 8 and 16 seater minibuses and minicoaches also luxury coaches upto 74 seats. All vehicles are equipped with sat/nav to ensure unfailing accuracy and a prompt response. Sit back and enjoy the ride, because peace of mind is part of the deal! Ideal for weddings and other special events, Prestene Travel Ltd offers an affiliated luxury limousine that comfortably accommodate six to eight passengers. Upon request, limousines may be equipped for on-the-road corporate meetings. Minibuses seat up to 8 passengers, or 16 passengers Ideal for evening outings, parties and other events requiring group travel. Depending on the number of passengers, these buses may be used for the airport shuttle service. Our affiliated luxurious minicoaches are designed to accommodate large groups in total comfort and style. With their separate luggage compartments, they are ideally suited for longer journeys with large groups of people and luggage. Depending on the number of passengers, minicoaches may also be used for the airport shuttle service. Prestene Travel Ltd is dedicated to providing a high-quality service at a competitive rate. Below is a detailed list of our standard rates and fees. Please contact us to get a quote for special arrangements. charges for a minibus to either airport price available on request. A service charge is not included in the prices listed above. We leave gratuities to the discretion of the customer, Our drivers will appreciate it. Prestene travel ltd are looking at bringing an airport shuttle service into effect for Jan 2015 this service will suit the individual traveller or couples any party larger than 3 persons wouldn’t benefit from this service and would benefit from a pre arranged taxi.